Blanch the asparagus spears in some boiling water for 2 – 3 minutes, then remove from the water and place in some cold water for 3 minutes to prevent further cooking. Roll out the puff pastry on a lightly floured surface into an A4 sized shape and cut in half. Cut one half in two and retain the remaining pastry for another time. Grease a baking tray with some butter and place the pieces of pastry onto the tray. 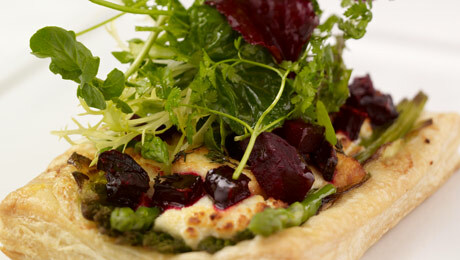 Place 4 pieces of asparagus onto each pastry and top with the crumbled goats cheese. Scatter the diced beetroot pieces onto the goats cheese. Place the baking tray into the preheated oven and cook for 15 – 20 minutes until golden brown. Serve immediately with Mixed Salad leaves, drizzle with some olive oil and juice of the lemon.